Gavin Zell and his father Bill, of Collarenebri in NSW, run an 18,200-hectare mixed cropping operation and have taken a novel approach to seeding, by hooking two Flexi-Coil cultivator bars together for increased capacity and reduced labour costs. Gavin started hooking his Flexi-Coil ST820 bars together back in the early 90s. “We started off with the one ST820 bar and then decided to get a second one to match it so that we could hook the two together; giving us 33.5 metres (110 feet) of width to seed more land in one pass. “I added a floating link to run the bars side by side and we can join them up or separate them within 15 minutes so it’s a really simple way to improve our efficiency. It also gives us the option of running at 16.8 metres (55 foot) - with just the one bar - depending on the area we need to seed,” he says. The ST820s, with their flexible frame, are designed to follow the contours of the land for depth accuracy, while the heavyweight construction helps penetrate hard soil. “When we looked around for a new bar back in the mid-90s, Flexi-Coil stood out because of its simple design,” Gavin says. On average, the Zell’s harvest two tonnes of wheat per hectare and 1.4 tonnes per hectare of pulse crops. 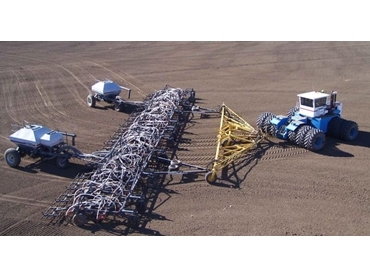 Their other Flexi-Coil equipment also includes two 1720 air carts, which they purchased second hand, and a 2320 air cart. The 1720 stood out due to its auger and metering system, while the 2320 appealed because of its six tonne grain handling capacity and simple design, Gavin says.